Question: What is your assessment of Starbucks financial performance during fiscal years 2005–2009? Assessment of the financial performance of an organization is very important for both the internal as well as external stakeholders. The management of an organization analyzes its financial performance in order to understand present financial of the company. Additionally, the information obtained from the analysis is used for planning and controlling various business activities of the organization. In order to make right decisions for achieving the organizational goals, the analysis of the financial performance is essential. The external users creditors, debtors, investors, analysts and auditor also analyze the financial performance of an organization in order to understand the trend of the past performance as well as present financial position of the company. On the basis of the profitability and solvency of the company, the stakeholders will determine their position regarding relationship with the company. In this paper, the financial position of Starbucks is analyzed for five financial years between 2005 and 2009. Financial statements of Starbucks are used for analyzing the financial position of the organization for the years 2005, 2006, 2007, 2008, 2008 and 2009. Different ratios will be calculated to explain different aspects of the financial performance such as profitability, investment, liquidity etc. In this paper significant ratios of Starbucks are calculated for consecutive five years in order to assess the financial performance of the organization. Ratio analysis is a quantitative technique used for analyzing the financial statements of a company. In this method, relevant, information is collected from the financial statements: balance sheet, income statement and cash flow statement. Ratio analysis can be carried out if the profitability ratio, liquidity ratio, efficiency ratios are calculated (Epstein and Lee, 2011). In the following table, all the required ratios are calculated for the five years: 2005, 2006, 2007, 2008 and 2009. In the above sections all relevant ratios have been calculated. Therefore, in this part, all the ratios will be analyzed in for making recommendations in order to improve the financial performance of the company in the competitive market. There are two profitability ratios which depicts the relationship between profit and revenue of the organization. From the gross profit ratio it can be understood that how much profit is generated from one unit of turnover. It also implies how effectively Starbucks has managed the production cost and carried forward it to its customers. Greater gross profit ratio implies better financial position of the organization. The gross profit margin of Starbucks is declining from 2005 to 2009. 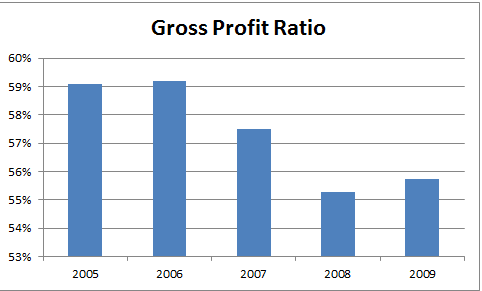 In 2009 the gross profit improved a bit from the previous year (Bamber, Braun and Harrison, 2008). Net Profit Ratio = (Net profit/ Revenue) X100 From this ratio, the net profit generated form unit turnover can be calculated. The major implication of this ratio is it depicts how efficiently the company has been able to generate net income after considering the cost elements. It is observed that form 2005 the net profit margin had started to decline gradually and in 2009 it improved from the previous fiscal year 2008. Efficiency ratios are calculated to explain how efficiently the organization has managed and used its resources. Efficiency ratio includes various ratios such as accounts receivable and payable ratio, asset turnover ratio and inventory turnover ratio. Inventory turnover ratio depicts how many times in a year the inventory has got completely sold and again replaced. The inventory turnover ratio for Starbucks has been calculated and it is seen that the ratio is decreasing gradually. It means the sales are increasing. High level of inventory turnover ratio is not expected as it has risk of holding obsolete goods. In Starbucks, most of the inventory is consisting of perishable goods, so high level of inventory turnover ratio is not desirable (Coombs, Hobbs and Jenkins, 2005). Asset turnover ratio assists in analyzing how efficiently the organization has been using its assets in order to generate income. From the asset turnover ratio of Starbucks it is observed that in 2005, the asset turnover ratio was high but 2006 and 2007 it has declined. 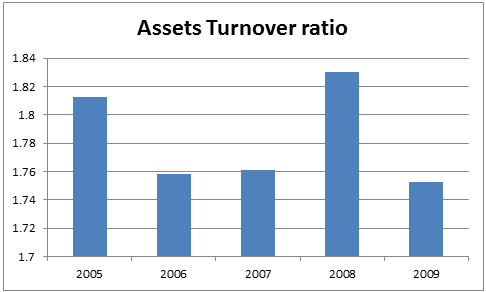 In 2008, the asset turnover ratio has been highest. But in 2009 the asset turnover ratio is significantly low which depicts that Starbucks has not been able to efficiently manage and use its asset (Davis and Davis, 2012). The accounts receivable turnover ratio is associated with the credit period of the oragnziation. If the accounts receivable turnover ratio is high it implies that most of the sales have been made on credit. The company allows sales at interest free credit period. But the low accounts receivable collection period is desired. In case of Starbucks, it is observed that the accounts receivable collection period was increasing from 005 to 2008 but in 2009 it has declined significantly. It has a positive implication for the company (Davis and Davis, 2012). This ratio implies how much credit period is allowed from the suppliers to pay the money. If the accounts payable turnover period is high it means that the company is allowed more time to pay its financial obligations. It is observed that the accounts payable period is declining over the years. That means the suppliers are not allowing much credit period and most of the payment is made on cash. It is not a positive implication for the organization (Hansen and Mowen, 2000). Liquidity ratios explain the liquidity position of the organization by analyzing how efficiently the company has managed its short term debt obligation for the given financial year. Two types of liquidity ratio are discussed in this section: current ratio and quick ratio or acid-test ratio. From this ratio the potential of the company to meet its short term liabilities is assessed. Basically, it reflects on how efficiently the company has been managing its operating cycle. The desired current ratio is greater than 1 which implies excellent financial position of the company. For, Starbucks it is observed that, the current ratio is improving gradually and in 2009 it has become greater than 1. It means that the company has the potential to meet all its short term debts and payables. It indicates that Starbucks is in a good financial position (Hart, Wilson and Fergus, 2008). Acid test ratio or Quick ratio also estimates the potential of the company to meet its immediate obligations using its short term assets. But, inventory must not be sold. The desired acid test ratio is 1. In case of Starbucks, the acid test ratio is improving gradually (Neish and Banks, 2003). Investment ratios are helpful in analyzing the financial performance of an organization in terms of utilizing the investment opportunities. Some investment ratios are calculated for Starbucks and discussed in this section. The objective of an organization is to maximize the wealth of its shareholders. The return on Shareholders’ equity helps to analyze how much return is generated for the shareholders. In case of Starbucks, it has been observed that the return on equity was increasing from 2005 to 2007. Then it started to decline. In 2009, the return on equity has improved slightly (Epstein and Lee, 2011). From this ratio it can be estimated how efficiently the capital has been utilizing by the organization. For Starbucks it has been observed that the organization has not been able to manage and utilize the capital effectively. The return on capital employed is declining continuously over the period (Coombs, Hobbs and Jenkins, 2005). It implies how effectively the organization is managing its asset and generating profit by utilizing its assets. It can be found that return on total asset has been decreasing from 2005 to 2008. In 2009, the return on assets has improved slightly (Neish and Banks, 2003). Starbucks must focus on utilizing its assets effectively for generating revenue. The net profit ratio is low as the operating costs are high. The operational activities must be improved in order to reduce cost. It is good that the current ratio is high which implies current asset is significantly higher than the current liabilities. But it is also observed that most of the current asset is unutilized, which is also not desired. In order to increase the accounts payable period, the organization must adopt a strategy in order to effectively negotiate with the suppliers. Starbucks must focus o generating more return from the asset and capital employed. Thus the return on shareholders’ equity will enhance. Bamber, L., Braun, K. and Harrison, W. (2008). Managerial accounting. 1st ed. Upper Saddle River, N.J.: Pearson Prentice Hall. Coombs, H., Hobbs, D. and Jenkins, D. (2005). Management accounting. 1st ed. London: SAGE Publications. Davis, C. and Davis, E. (2012). Managerial accounting. 1st ed. Hoboken, N.J.: John Wiley & Sons. Epstein, M. and Lee, J. (2011). Advances in management accounting. 1st ed. Bingley, UK: Emerald. Hansen, D. and Mowen, M. (2000). Management accounting. 1st ed. Cincinnati: South-Western College Pub. Hart, J., Wilson, C. and Fergus, C. (2008). Management accounting. 1st ed. Frenchs Forest, N.S.W. : Pearson Education Australia. Neish, W. and Banks, A. (2003). Management accounting. 1st ed. Boston: McGraw-Hill.